This Sativa dominant variety was bred by backcrossing Sweet Diesel and the Orange clone from California. The result is a delicious and complex taste of sweet peaches and creamy lemon back notes, together with its medicinal properties, makes this variety very unique. Peach Puree CBD is exceptionally well suited to people with medical conditions such as: cancer, AIDS, insomnia, anxiety, gastrointestinal conditions, epilepsy, muscle tension and many others. High CBD content was confirmed by analyses and revealed a 1:2 THC / CBD ratio (5% / 10%). 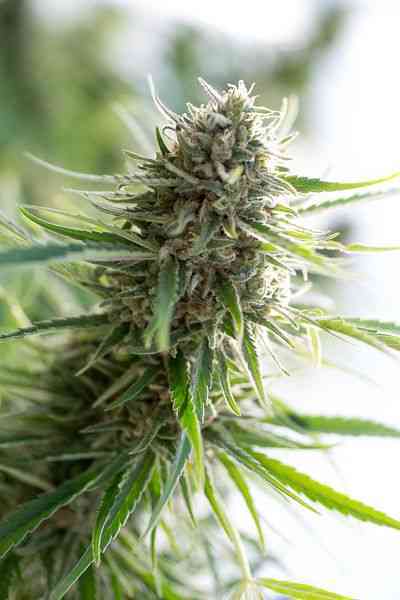 This easy to grow and vigorous strain produces branches with dense buds covered by sticky trichomes all over, empowering you with its citric, peachy scent and spectacular purplish colours. The diesel fuely aroma is almost unrecognisable, but you can still feel its tender background on the exhale. Peach Puree CBD causes very gentle and uplifting effect suitable for any time of the day.